A Greek Red Cross volunteer comforts a crying Syrian refugee moments after disembarking from a flooded raft at a beach on the Greek island of Lesbos, Oct. 20, 2015. The U.N. refugee agency, UNHCR, reports a spike in arrivals in Greece as a result of a last minute scramble by refugees and migrants to get to Europe before winter comes and sea crossings are no longer possible. But spokeswoman Melissa Fleming warns this large number of people is increasing tensions in the small Greek islands. She notes more than 27,500 people on the islands are waiting to be registered or transported to the mainland. A group of migrants walks in Dobova, Slovenia, Oct. 20, 2015. In the meantime, the crowds are increasing and sporadic violence is breaking out as existing reception facilities are unable to adequately register, fingerprint and screen this huge backlog of people. The European Union has agreed to distribute 160,000 refugees among its member states, but only 19 refugees have been relocated. 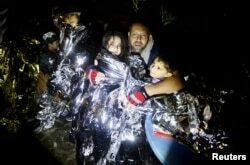 A Syrian refugee tries to keep his children warm after being rescued by Greek fishermen on the Greek island of Lesbos Oct. 19, 2015. Fleming says borders along the Balkan routes have reopened and that UNHCR has been providing whatever assistance it can, including food, water, and blankets to refugees stranded on the Serbian-Croatian and Croatian-Slovenia borders. Fleming added that smugglers are aware their business is likely to shut down in the coming weeks, so they are offering discount rates for the Mediterranean Sea crossings and packing many more people into the flimsy boats, increasing the dangers. The UNHCR reports 19 people have died in the past nine days in five separate incidents while crossing the sea from Turkey to Greece.